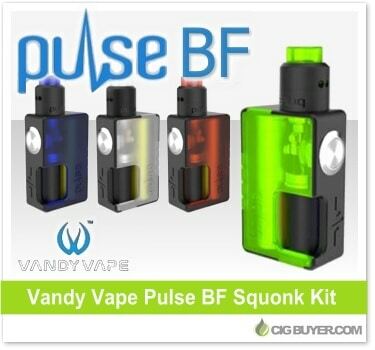 With the boat load of mechanical squonkers that have come out over the past year, the Vandy Vape Pulse BF Squonk Mod has remained one of the most popular and affordable options. You can still buy the Pulse Mod by itself, but Vandy Vape has put together a complete Vandy Vape Pulse BF Kit with a matching Pulse 24 RDA. The kit includes new transparent ABS side panels and is powered by either single 18650 or 20700 battery. It includes a built-in 8ml squonk bottle, and the Pulse 24 RDA features a 24K gold-plated postless deck with adjustable Kennedy-style airflow to provide a direct path to the coil.